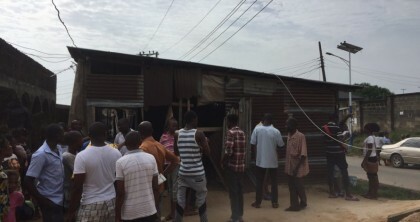 Cross River Police Command has confirmed that seven people and not 30 died in Thursday’s electrocution that occurred while some football fans were watching the Manchester United and Anderlecth game at a television viewing centre. The incident happened at around 9.30 p.m. at Nyagasang area of Atimbo in Calabar Municipal Local Government area of the state saw 11 others hospitalised. Mr Hafiz Inuwa, the state Commissioner of Police, gave the numbers at a news conference on Friday in Calabar. Inuwa said that the briefing became necessary following some reports in some national dailies and online blogs that over 30 persons died in the tragic incident. “”To put the record straight, 18 persons were affected by the incident and taken to the University of Calabar Teaching Hospital (UCTH). ““From the records available to us, seven people died on arrival, 10 are in the emergency ward of the hospital while one victim is currently at the intensive care unit of the same hospital. “ “The false reports out there are alarming. This press conference will put an end to the rumours out there that over 30 persons died. “”People should stop spreading falsehood in sensitive issues like this. The earlier reports that over 30 persons died and about 50 escaped death is false,” he said. Eyewitnesses had told NAN that two separate blasts from electrical installations occurred around the centre before a live high tension cable fell on the zinc makeshift structure where many of the fans were watching the European League.